This is the second program schedule for Laserium, circa 1976-77. The program front cover features a futuristic planetscape with a laser show image; the rear cover features an ad for two albums and a live tour of the Electronica band Tangerine Dream. 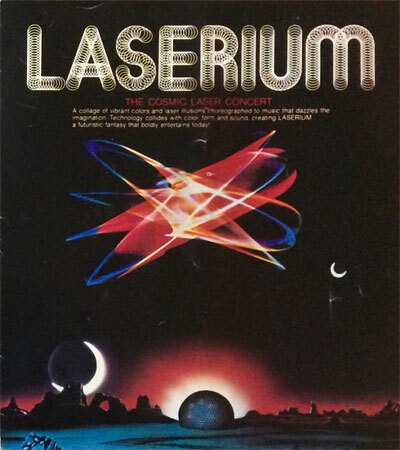 On the inside are programs for Laserium I and Laserium II shows, plus profiles of the creator, technology, and company behind Laserium, as well as a list of locations where Laserium was presented (by this time having expanded beyond its original Los Angeles venue at Griffith Observatory), and an order form for Laserium-related merchandise. Tri fold glossy finish paper pamphlet, 7&frac38;" x 8½" (closed), 22&frac18;" x 8½" (open). Very Good +, as New; closed program was lightly folded in half vertically at some point, but not creased; some minor wear on the covers from this folding, plus some light wear at the top and bottom of the page folds.